A fractal divergence is a hidden divergence, based on Bill Williams' fractals. A bullish fractal divergence is a combination of two lower fractals, the last of which is located below the previous one, and, at the same time, two candles to the right of the Low of the last fractal have Lows higher than the previous fractal level (see screenshot 1). A bearish fractal divergence is a combination of two adjacent upper fractals, the last of which is located above the previous one, but, at the same time, two candles to the right of the top of the last fractal have Highs lower than the first fractal level (see screenshot 2). 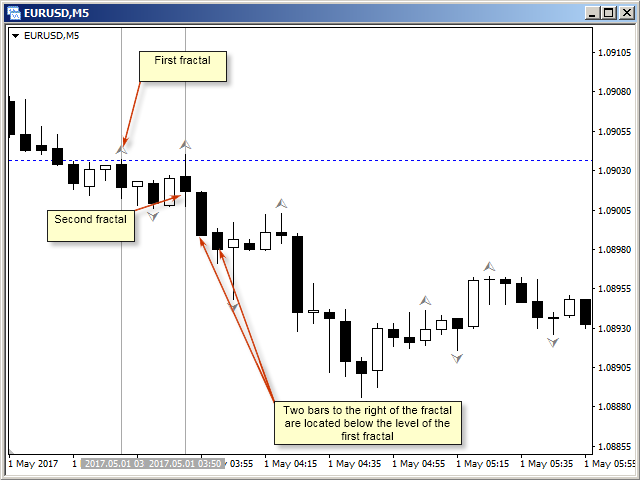 The FractalsDivergence_Pattern indicator displays bullish and bearish fractal divergences in the form of support and resistance levels, denoted by rectangles of the corresponding color. The height of each of the area is the price difference of the first and second fractals. The left border indicates the first fractal of the divergence, while the right border shows the last bar, referring to the second fractal, i.e. the bar which must be closed in order to register a pattern. The resistance area is displayed in red (the "Color of bear pattern" parameter). Its lower boundary lies at the High of the second fractal (see screenshot 3). 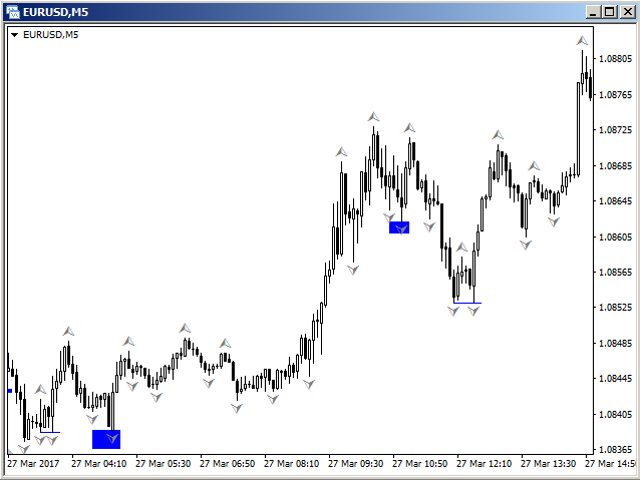 The support area is displayed in blue (the "Color of bull pattern" parameter). The area's upper boundary indicates the Low of the second fractal (see screenshot 4). 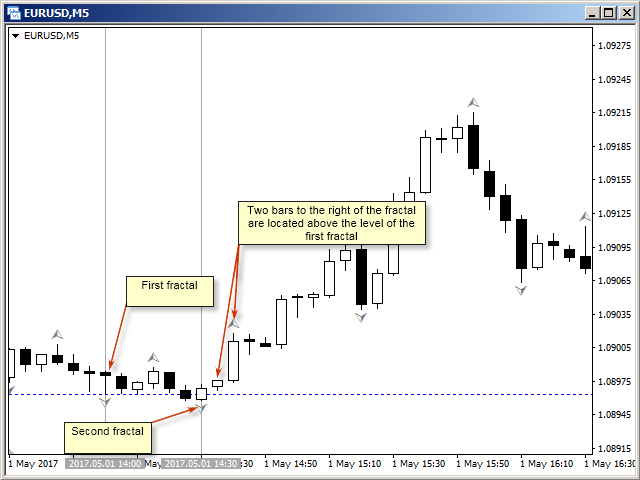 The indicator signals can be used for trading both rebounds from the support and resistance levels, and their breakout. This depends on the trading tactics selected by the trader. Bars on the left - the number of bars on the left which have a lower High to register an upper fractal or a higher Low to register a lower fractal. Bars on the right - the number of bars on the right which have a lower High to register an upper fractal or a higher Low to register a lower fractal. Color of bull pattern - color to display the bullish fractal divergences. 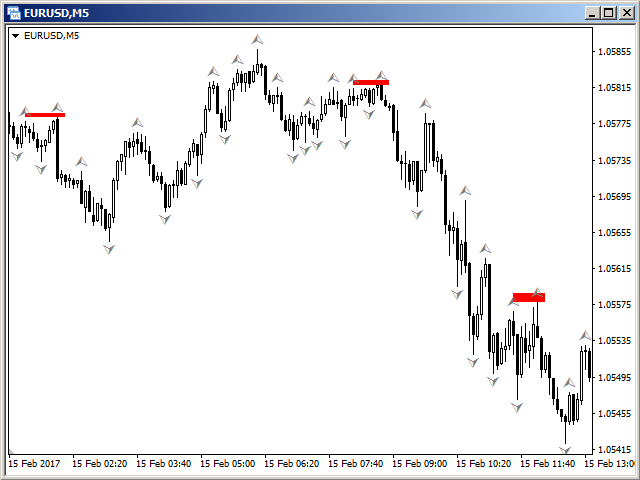 Color of bear pattern - color to display the bearish fractal divergences. Alert on pattern found? - enable/disable pop-up Alert windows when a pattern is found. Notification on pattern found? - enable/disable sending push notifications when a pattern is found. E-mail notification on pattern found? - enable/disable sending the e-mail message when a pattern is found. The number of bars to display - the number of bars to display the indicator values. 0 - all available history. Surprised at how well this works, thank you for it being free. Added the parameter "E-mail notification on pattern found?". If this parameter is set to "Yes", a message is sent to the e-mail specified by the user (in the terminal settings) in case a new pattern appears. - Bars on the left. Specifies the number of bars on the left which have a lower High to register an upper fractal or a higher Low to register a lower fractal. - Bars on the right. Specifies the number of bars on the right which have a lower High to register an upper fractal or a higher Low to register a lower fractal.